The first reviews for Pacific Rim Uprising are in. Guillermo Del Toro crafted a truly entertaining movie that was unabashedly meant to be a showcase for giant robots fighting equally giant monsters with 2013's Pacific Rim. Now, five years later, we're finally getting a sequel. Unfortunately, Del Toro didn't return to direct and the story he was developing didn't end up being used. So, how did director Steven S. DeKnight manage? It sounds like the results are a bit mixed, but ultimately, if you're just in it for more robot and kaiju carnage, you should come out feeling satisfied. Pacific Rim 2 centers on a mostly new cast, with Star Wars: The Last Jedi star John Boyega taking the lead as the son of Idris Elba's Stacker Pentecost. While the majority of these initial reviews make it seem like the story and characters aren't the main reason to show up, it sounds like Boyega could be a credit to the sequel. Here's what Den of Geek had to say about Pacific Rim 2 in their review. "Pacific Rim: Uprising does a couple of things better than its predecessor: Boyega is a more charismatic lead than [Charlie] Hunnam could ever be...I can't hate it; on some level every genre fan likes watching monsters and cyborgs swinging skyscrapers at each other." As of this writing, Pacific Rim: Uprising has a 65 percent approval rating from critics on Rotten Tomatoes, with 13 fresh reviews, against 7 rotten reviews. For the sake of comparison, the original Pacific Rim currently sits at a respectable 71 percent approval rating, with 269 reviews counted. The New York Daily News praises director Steven S. DeKnight's ability to craft a satisfying CGI fight scene and promises that the movie is fun. "DeKnight shows he can pilot a CGI fight sequence as well as his predecessor, Guillermo Del Toro ('The Shape of Water'). These movies can be fun once the colossal foes start grappling." 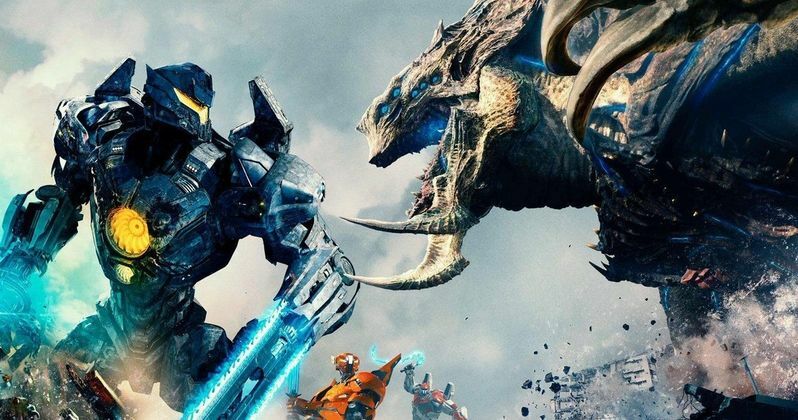 So, what of those who aren't buying what Pacific Rim: Uprising is selling? Entertainment Weekly says, "If you enjoyed 2013's Pacific Rim but secretly wished it was more like a vapid Transformers sequel, then you'll love Pacific Rim Uprising." That's pretty rough, considering how many people have hated the last couple of Transformers movies. Though, they've still managed to be big hits at the box office, with the exception of Transformers: The Last Knight. Variety also doesn't have much nice to say about the sequel, calling it a "paint-by-numbers" movie that sets up a sequel that seems to just be "wishful thinking." "Paint-by-numbers approach to franchise construction, replete with a formulaic promise of future installments that, on the basis of this entry, feels mostly like wishful thinking." Indeed, it's been said that there's potential for an entire Pacific Rim cinematic universe, if Uprising does well enough at the box office. However, early tracking doesn't paint a pretty picture. This sequel will be relying heavily on foreign box office in order to make it a big enough hit to justify Pacific Rim 3. Whatever the future may hold, it sounds like this installment provides enough eye candy for those hoping to get their big blockbuster action movie fix. You can check out more of the initial reviews for Pacific Rim: Uprising over at Rotten Tomatoes.